Wanna reduce kids sugar intake? 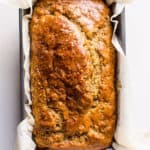 This is THE BEST healthy, moist and simple banana bread recipe your kids will actually eat! Preheat oven to 350 degrees F. Line 9 x 5 loaf pan with unbleached parchment paper. In a large bowl, mash bananas with a fork or a masher. Add eggs, applesauce, maple syrup, oil, vanilla, baking powder, baking soda and salt; whisk to combine (masher works fine). Add flour and stir gently just enough to mix. Pour batter in prepared loaf pan and bake for 50 – 60 minutes or until a toothpick inserted in the middle comes out clean. Remove from the oven and let cool for 15 minutes. Then transfer to a cooling rack to cool off completely. Cut into 10 slices and enjoy. Store: Keep in a cool dry place in a glass airtight container for up to 4 days or freeze for up to 3 months.